Your life is too comfortable. But you already knew that. The potential is there, but it hasn’t been realized. Maybe you suffer from brain rot. Maybe you’re easily distracted and can’t focus. Whatever your issues, there is an easy fix. You must enable death ground. When pushed backed against a physical boundary, an army can either fight their way out or be annihilated. There is no escape route. This is a zero-sum outcome. It’s kill or be killed. Death is the ultimate motivator for high level achievement, especially during battle. Because of the human instinct to stay alive, an army fights with fierce determination when cornered or cut off. 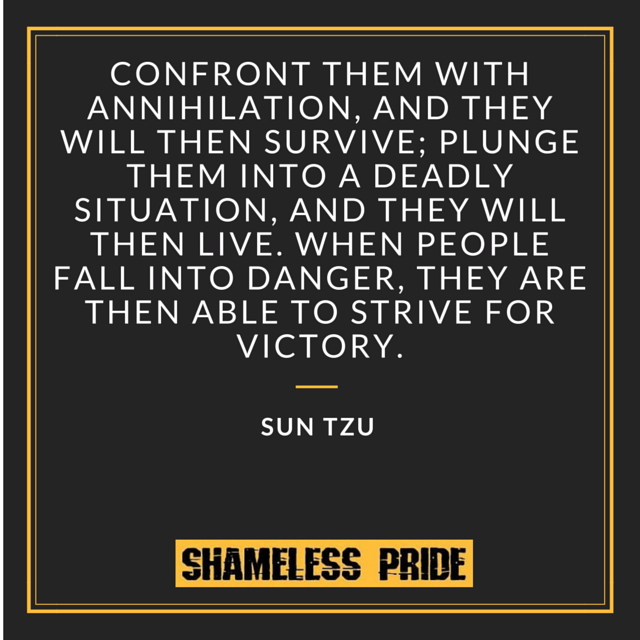 They will give everything they have, and even if they fall in battle, they will inflict maximum destruction before they do so. Out of options and faced with death, troops execute at an extremely high level. 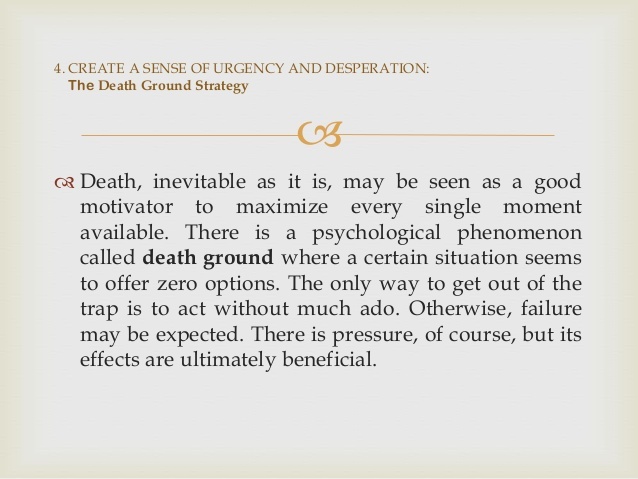 Robert Greene also touches on the death ground strategy in his book, The 33 Strategies of War, as depicted in the below graphic. 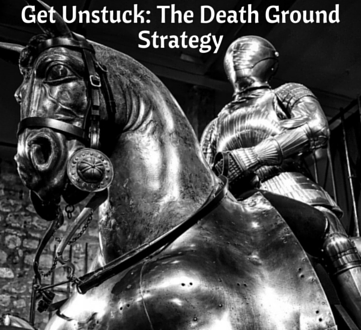 The death ground strategy has a place in your life. You create a sense of urgency and desperation. 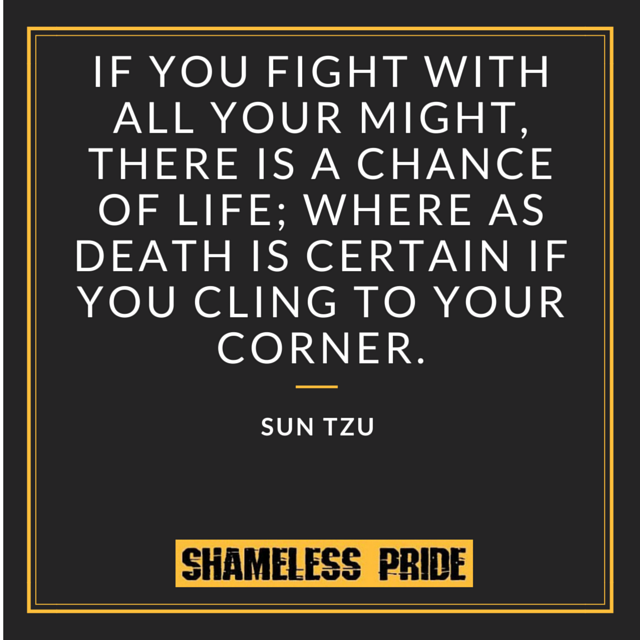 Even though you are not faced with imminent death, you increase the stakes and develop the belief that your achievement is a life or death situation. There is no in-between. King Xerses of Persia had gathered hundreds of thousands of troops from all corners of the Persian Empire. His goal? The invasion and destruction of Greece. The Spartan King Leonidas gathered 300 fierce warriors, members of his royal guard, and took off for Thermopylae. Along the way, he gathered an additional 7,000 troops from other Greek factions. Thermopylae was also known as the “Hot Gates,” a narrow coastal pass that was on the way to southern Greece, and thus would be the path in which King Xerses and his army would travel. This location was chosen for a reason. The terrain was perfectly suited for the Greek style of warfare, as their famous phalanx could easily block the pass and negate the supreme numeric advantage of the Persians. For three days, the battle raged, until finally the Spartans were betrayed. A mountain pass was used to outflank their position, resulting in the annihilation of the entire Spartan unit (the other Greek armies were able to escape). King Leonidas and the Spartans utilized the death ground strategy. As Spartan warriors, all they knew was warfare. They had trained their minds to understand that death meant honor, and retreat meant disgrace. It was as if there was a mountain behind them, cutting them off from home. This mental death ground strategy was how they approached every battle. The Spartans could have retreated. They could have stayed home in Sparta and waited for the Persian onslaught. However, they chose to engage and fight to the last, hoping their actions would stall the Persian onslaught and give their fellow Greek warriors the crucial time necessary to mount a defense campaign. They chose the best possible terrain and defended it ferociously, claiming 5-10 times more casualties than sustained. The Spartans, free men of Greece protecting their homeland, had a fighting spirit and a sense of urgency that was unmatched by the Persian army, many of whom were slaves and forced conscripts. Their unwavering mindset is what made the difference. Deadlines are a modern, humane type of death ground. By giving yourself a pre-determined time to achieve something, you feel the pressure to produce. In 1998, author Robert Greene was working on his first book, 48 Laws of Power. He was behind schedule and had missed his deadline. He was given an ultimatum – finish the book, or it will be cancelled. This was all the motivation Greene needed. He thought back to his days of working dead-end jobs, vowing to never go back to that life (he had 80 jobs in his younger days). He used this deadline to spur him to action. He delivered, and 48 Laws of Power went on to become an international bestseller with over a million copies sold. Taking risks means embracing the unknown. It will never make sense to take a risk. The mind is wired to be fearful of what it cannot foresee and understand. You will doubt yourself because your mind wants you to stay where you are; safe and content. By setting a deadline, you remove your ability to make excuses. You put skin in the game and force yourself to produce. This heightened sense of determination will allow you to achieve mental flow, consistency, and eventual mastery. When engaged in the same mundane tasks day after day, the brain goes into a shell. This rot is commonplace in modern society, because most people fail to use their brains in any other meaningful way. Creative and imaginative thoughts dry up because the brain is not being challenged. The brain is smart; it’s punishing you for wasting away your life. It’s warning you that you are on a destructive path that leads to nowhere. Are you okay not giving your best efforts? You don’t need to do anything extraordinary to live a comfortable life. You can be content with average and still go on vacations, own a home, and drive a decent car. Your life can lack motivation and purpose and sill show no signs of abnormality. Uninspired, you will still go on to live a long life, health permitting. There will be a void, but you will live on nonetheless. Historically, a long, peaceful life was far from the norm. Life was hard and the immediate future, unknown. Genocides, plagues, extreme poverty, warfare, and natural disasters were the norm. Imagine yourself in Baghdad, Iraq. You’re a blacksmith, forging steel blades for the army of the Abbasid Caliphate. You begin to hear rumors, terrible rumors, that the infamous Mongol calvary is quickly approaching. They have demanded that the city surrender, and your leader, Al-Musta’sim, has refused. One day, you look out beyond the city walls to see the Mongol hordes in vast numbers, surrounding your beautiful city on all sides. Soon, the thunderous sound of siege engines and catapults fill the air, smashing away at the city’s defense. You realize it is only a matter of time before they breach the walls and take over your city. At this point you are panic stricken. You know that the Mongols are ruthless conquerors; there is little chance you escape the city alive. A week later, you hear that your leaders have surrendered the city. A few days after that, the Mongols enter the city. No description can do justice to the horrors that followed. The sack of Baghdad lasted a week. More than a million inhabitants were slaughtered. Al Musta’sim was wrapped in a carpet, beaten with clubs and trampled to death by Mongol horses. Mosques were pulled down. Libraries burned. Great men of learning were tortured to death. Artisans were enslaved. Women were dragged, abused and left to die along far-away roads. The dams on the Tigris and the Euphrates that the Abbasids had built up over a period of five centuries were demolished. The destruction of dams throughout Central Asia depressed agriculture and slowed population and economic recovery for many centuries. Baghdad, which was once the premier city of the world, became a ghost town. They pillage, plunder and murder at will, sparing nobody. You somehow escape the city walls, unsure how you will survive with no supplies, food, or shelter. Everyone you knew was dead. If your back was against the wall and you had to fight for survival, would you fight or give up? Chances are all of your basic needs are being met. You do not need to fight daily for survival. You have food to eat and water to drink. You have clean air to breathe. You most likely have an income stream that enables you to, at a minimum, acquire basic goods and services to live a comfortable life. Most important of all, you are relatively healthy and free from imminent death and danger. It is natural to take these things for granted. Carnage and destruction have been commonplace throughout history. Everyday citizens had to fight for their survival. Life was counted in days and months – not years. Today, your chances of dying a violent death are near zero. Certainly, mass killings and death still occur – mainly in third world countries – but the scale of these occurrences represents a fraction of what used to be considered normal hundreds and thousands of years ago. Because of this, you don’t have an edge. You take what the day throws your way, and in return, never rock the boat. You have no death ground strategy, and you know it. Inaction means death. You are squandering life. Opportunities exist, but you shun them. You still waste time. In addition to a safe existence, you have access to knowledge unthinkable even decades ago. Passion and purpose are all that is needed. 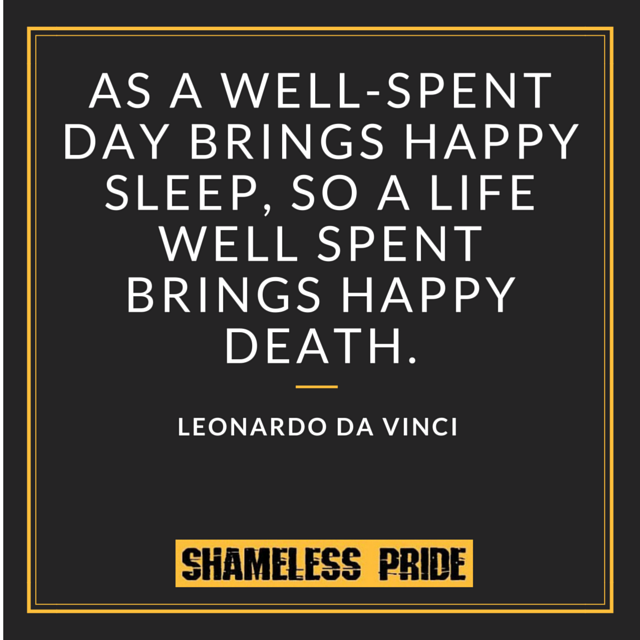 By neglecting your body and mind, you are admitting that you don’t take life seriously. By disrespecting time, you are disrespecting yourself. 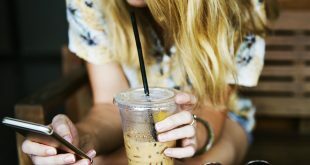 A modern day death ground strategy will help spur you to action. Like the Spartans at Thermopylae, you are embracing your demise and using it to do your best possible work. You’re holding your death ground. Your word is your bond, thus your deadlines are non-negotiable. Come to believe that you are on borrowed time, and that making something of yourself should be your singular goal in the present. Scheduling your time for creative endeavors will make all the difference in the world. Watch as your effort levels are enhanced and you give more thought and attention to the task at hand. The alternative is grim. Inaction means regret and dismay; a life not lived to the fullest. This is the path of many, but it will not be your path. You will set out from here, and smash your goals. No more delays. There is no time to waste. Do you have your own death ground strategy?